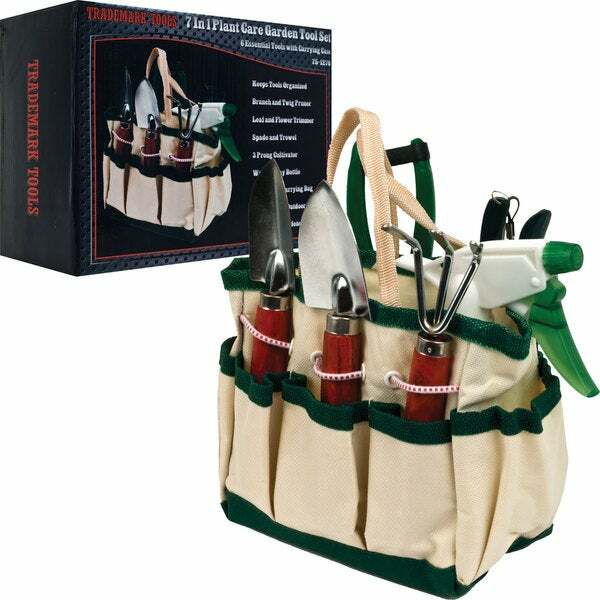 Equip yourself properly for all of your gardening endeavors with this seven-in-one gardening tool set from Trademark Tools. Each tool is durably constructed from wood, metal and plastic for quality, and are conveniently sized to fit in the fabric carrying bag. To help you make horticulture painless, the set comes with a trimmer, a spray bottle, a pruner, a spade, a trowel, and a cultivator. This all in one plant care garden tool set is the perfect collection to allow those with the green thumb to take care of their plants. As always fast shipping from Overstock. Just the right size to tend to my orchids. I also like the little tote, it keeps the tools in one place and has enough space for an extra mister bottle. for the price it was not what i expected, very disappointed, this is more for kids not some one who digs in flowers. would send it back but then they charge me for that. just tossed it in the garbage, no way i would give this for a gift. These so-called tools are cheap and teeny tiny, so of course a couple of them broke or bent the first time I used them for my albeit small yard. This locket looked bigger in the picture. Cant fit a picture in it! Too small. It looks like it was made for kids. Really embarrassed I ordered this, cheap and way too small.